Fumbling my way through an anxious life! Over the past few years, the word ‘procrastination’ has increased in hipster popularity. It’s become cool to procrastinate, offering the perfect excuse as to why we don’t get things done. I have battled in my head as to whether I procrastinate or I am just damn lazy. I have plans to get things done, however prefer to defer the doing in favour of overthinking. From this I wear myself down mentally and ultimately decide the doing is not for me, it can wait an hour or two or maybe a few days/weeks. I decide to read further on in my book or pick up my phone as a means to distract. 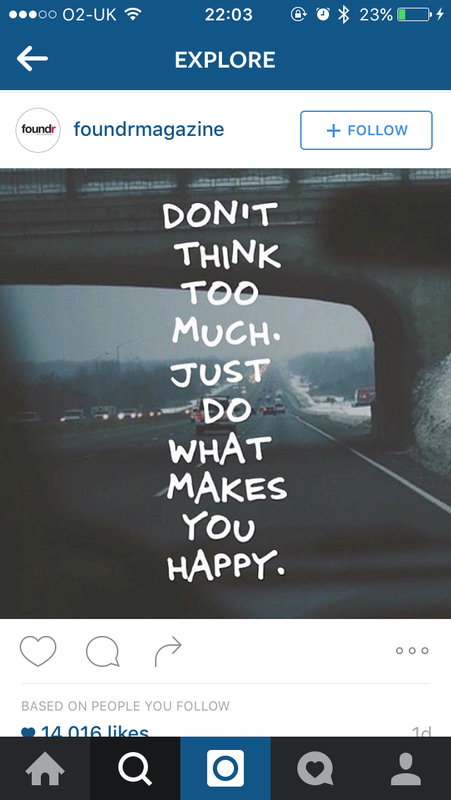 I have found myself doing this with all tasks in my everyday life… never just doing, always just thinking. I fight with negativity, as overthinking and not doing increases thoughts of self loathing. You feel guilty for not being more proactive and find yourself in the same position all too often, a vicious cycle of dissatisfaction and longing to be the person you want and know you can be. Unfortunately, for myself and like minded others, we are judged too often. Some, simply cannot see past our exterior, eye rolling and tutting as they observe our bodies to be lazy. What they can’t see is the internal battle, the mental exhaustion we endure everyday from running a marathon of crosswired thoughts, attempting to untangle and make sense whilst we continue our daily exertion. We envy people who can organise their thoughts succinctly, allowing them to get things done peacefully. I have grown weary of the self loathing I feel from not being as productive as I would like to be therefore, yesterday, I decided to do and not think. I have been wanting to organise certain rooms in my house before I return to work. I set myself clear goals of what I wanted to accomplish, not realising at the time how much crap I actually have! In despite of this, I felt focussed and in control yesterday. I felt motivated. I knew, had I sat and thought about what I wanted to do instead of making a start, my mind would slip into a semi-conscious state of existence. Through overthinking, I would become overwhelmed thus destroying my positive mind state to be productive. I began by savagely pulling everything out of those overcrowded draws, filled with nothing but old receipts, wrappers and redundant electrical leads. Surprised to discover the lost items of 2015. I threw the majority of what I found in the trash or bagged it up for charity. I became slightly obsessive about getting rid of items, believing a clear environment is a positive one as it also declutters your headspace. The process took around four hours, only allowing myself to leave once I felt organised. It wasn’t plain sailing, I continued to battle with my thoughts. At times, I would sit, staring, thinking about my next steps, looking around at all that had to be done, I’ll put that over there, this needs to go in the trash, that needs to go in the back room. I would realise ten minutes had past without actually picking anything up. Looking at the piles of household goods, to me, it didn’t make sense. I knew what I wanted the end product to be, but I couldn’t foresee the step by step guide to get me there. This is a regular occurrence in my everyday life. I feel easily swamped by everyday tasks. Sometimes, my thoughts win and I hide away, other times I can muster up the strength to fight back. I need to accept that I can’t think as clearly as others, and take solace in that I can still get things done to an acceptable standard. Even though my head space was a whirlwind of disorganisation. I knew that if I walked away I would feel 10 times worse. I didn’t listen to the furor of stress inducing thoughts, instead I just kept going. Hours past but as time continued I found myself in the zone. It rarely happens as so frequently, I give up. But yesterday, I got to experience the feeling of being immersed in an activity, to be so focussed and involved that time flew. It became enjoyable and the end product made me feel relaxed and content. I was proud that I had created a space in which I could feel at ease. I had created a space in which I could think. “I fight with negativity, as overthinking and not doing increases thoughts of self loathing. You feel guilty for not being more proactive and find yourself in the same position all too often, a vicious cycle of dissatisfaction and longing to be the person you want and know you can be.” This is exactly how I feel! I’ve been trying to find a way to sum up this feeling for a while now, and you have nailed it!